I've loved hats ever since I first read Caps For Sale, which was more about salesmanship than fashion. But the only childhood hat I remember was the the cotton sunhat I had to wear at the beach, along with copious amounts of Coppertone sunscreen. My first non-utilitarian topper was a vintage pillbox I used to wear to clubs in my teens. It had a tiny veil, went well with my stiletto heels and red lipstick, and helped me convey a glamorous attitude, even when I didn't feel that way. I've since accumulated many wonderful pieces of headgear, including a leopard-skin pillbox, a deep-brimmed black velvet confection covered with crepe roses suitable for a Victorian mourner, a snappy porkpie and a beaver cloche with an elaborate feather spray that I bought at a shop in New Orleans that could have provided a wardrobe for any number of Tennessee Williams characters. My wardrobe would also not be complete without my witch hat and my Yankee cap, both useful for casting spells. The importance of hats was recently brought home to me when the doormen in my building were provided with new uniforms, including the classic peaked cap, which they'd never had before. Apparently, the brokers showing apartments here felt that the upscale address deserved an upscale look. Yes, it's all about attitude - but I have to say that the poor guys look miserable. 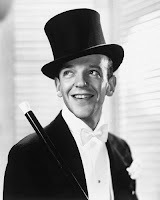 They could learn something from Fred Astaire.